Discussion in 'Off-Topic' started by -=Lurker=-, Apr 2, 2009. My buddy went to the hospital ER today. He has diabetes and when they drew blood it was purple? Anyone? Lack of oxygen in the blood? Yeah I saw the lack of O2 one. He smokes 2 packs a day.... He was hurting bad today and he's a tough mofo. I didn't see it myself but it was described as "lavender". ?? OK an that happens why? Anyway, he's spending atleast tonight in the ER. They didn't comment on his outlook so much. Just said his blood sugar was too high. Dude was grunting in my truck everytime I hit a bump. It can be that nurse made a mistake and drew the blood from Vein, not the artery. Sure be an interesting mistake. Hmmm, interesting. Thanks for your time demonizeZ. My friend took a stapler and stapled my arm once, when I pulled the staple out it the blood was purple. How high was his blood sugar that they are keeping him overnight? Grab a Humalog Quickpen and pump some insulin in him and he should be good to go. If you let it get high enough you can get DKA. Which can be pretty bad. It's essentially acid in the blood, which can eat at muscles/whatever. Hospitals like to keep patients for observation just in case. If the guy went in for diabetes and was still conscious when you brought him in, he'll probably be fine. It is important to note that to an untrained person the symptoms of acute DKA, such as breath odor, are very similar to alcohol intoxication, and it is easy to assume that the person is drunk instead of suffering from a diabetic emergency. A high anion gap indicates that there is loss of bicarbonate (HCO3−) without increase in chloride (Cl−). During treatment, a drop in bicarbonate is compensated for by an increase in chloride from IV fluids. This is also known as hyperchloremic acidosis. The effect causes the anion gap to move toward a normal value despite persistence of metabolic acidosis. At patient presentation for treatment, both types of acidosis may be present, and the elevation in the anion gap may be less than expected for the degree of bicarbonate level reduction. Serum potassium concentration is often elevated at presentation as insulin deficiency results in potassium movement out of the cells into the extracellular fluid. Insulin therapy lowers the potassium concentration by forcing it into the cells and may cause severe hypokalemia, particularly in patients with a normal or low serum potassium concentration at presentation. At this point, DKA is life-threatening and medical attention should be sought immediately. Kussmaul breathing ("air hunger"). A type of hyperventilation where patients breathe very deeply at a normal or increased rate. This is a sign of severe acidosis. He got that far before he wanted to go to ER. May have saved his life. As for diabetes. I know few people who are diabetic. They just hate their life... They are from armed forces too. They never use to watch any thing, very strong people. Now they over do any thing or neglect any thing in diet or other wise. Its trip to doctors for check up. Especially if you develop cholesterol problems with it. Most type 2 diabetics (usually the fatties) won't go into DKA. Most of the times its just type 1's that get that. the blood isnt exactly blue, if you slice an artery you see a very bright red color because there is more oxygen. if you slice a vein your going to see a darker red blood. heres an image to help visually see the difference. the blood on the left is from an artery(oxygenated), the blood on the right is from a vein(deoxygenated). Just FYI. You always draw from a vein. You never stick an artery either. I know that there are types of arterial access, I can't remember what they are though, and they are quite rare. And I assume they would be done by a specialist of some sort. FYI iafter 5 days in the hospital they diagnosed it to a Pancriatic disorder of somekind. He's still in bad shape. Yeah he's overweight. Yeah he's diabetic and yeah he lives an affluent lifestlye (lots of alchhol, sweets and red meat). It's most likely do to his lack of medicating though. He stopped taking his $700/mo medicaaton last month (we found out later). Hopefully he'll be ok and change his ways. Thanks for all the input guys. The blood gets oxygenated when it hits air, regardless of where it comes from, so unless that's in a vacuum, I don't buy it. All blood is red, just different shades. 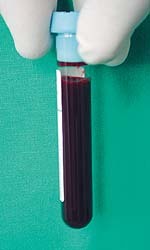 Here is your pick of blood drawn into a vacuum via a Vacutainer blood tube.